Hey! Guess what! It’s November 1st! You know what that means? 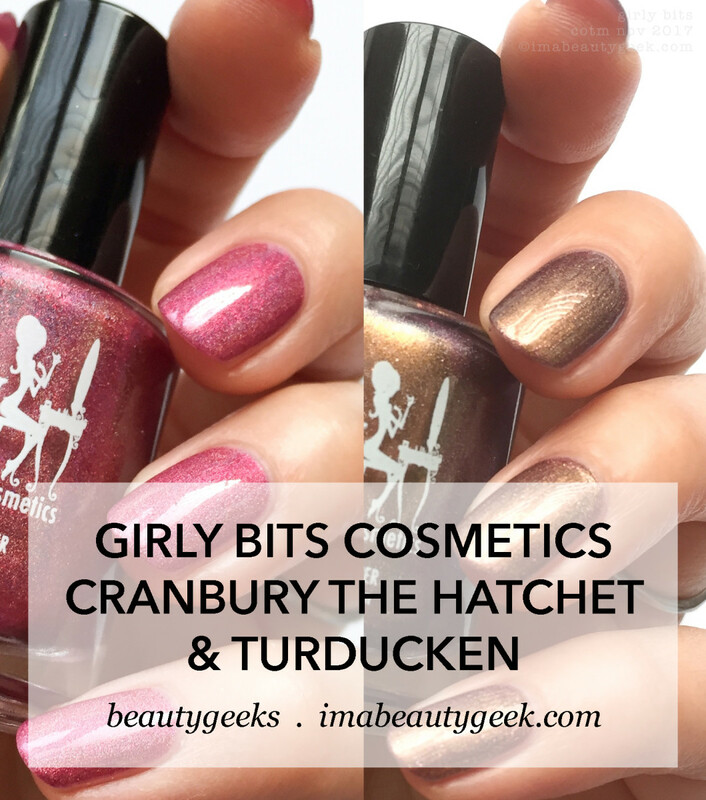 It means it’s time for the Girly Bits Cosmetics Colour of the Month Duo! Wheeeee!!! If you’re in the US, Thanksgiving is coming up. You know what goes good with Thanksgiving? Turkey. And you know what goes good with turkey? Duck. #TrueStory. 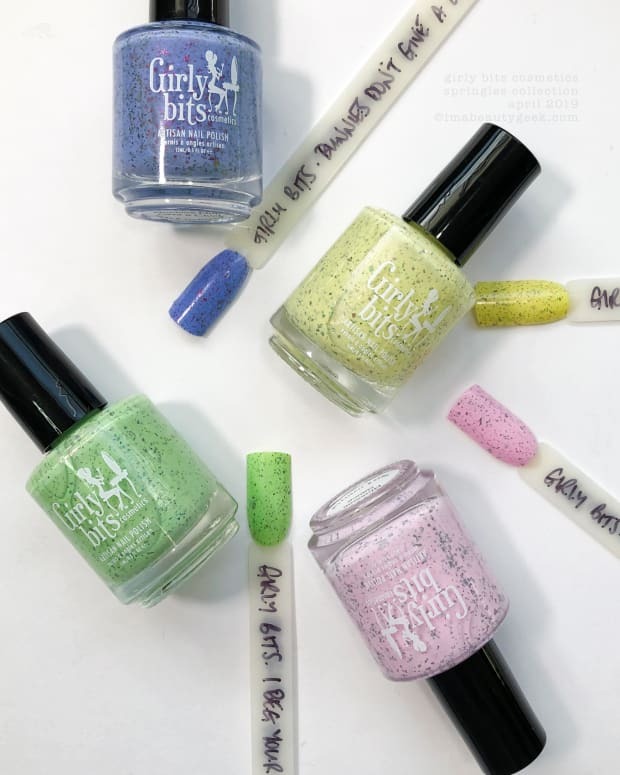 I’m not going to break these down and describe them to you because if you’re here, I gotta figure you got eyes and can just see all the magic that’s jammed into these amazeballs Girly Bits Cosmetics COTM shades. 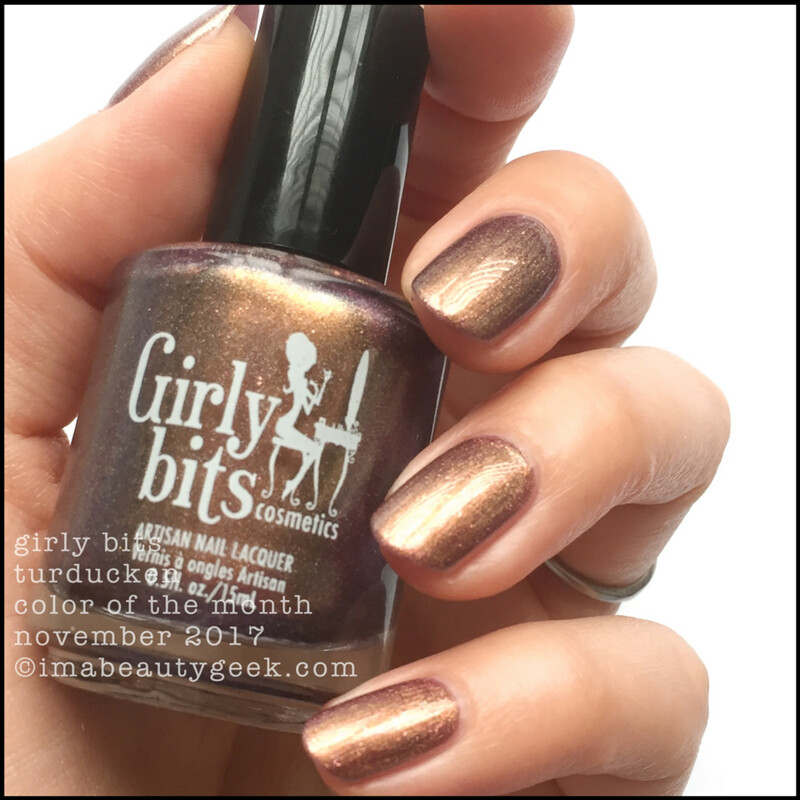 Turducken is one of those polishes that surprised me - a lot. Indoors with natural light, I thought it was slammin’! The almost purple tone to the shimmery coppery red is something I don’t know if I’ve ever seen on my nails before and that makes it hella-special. 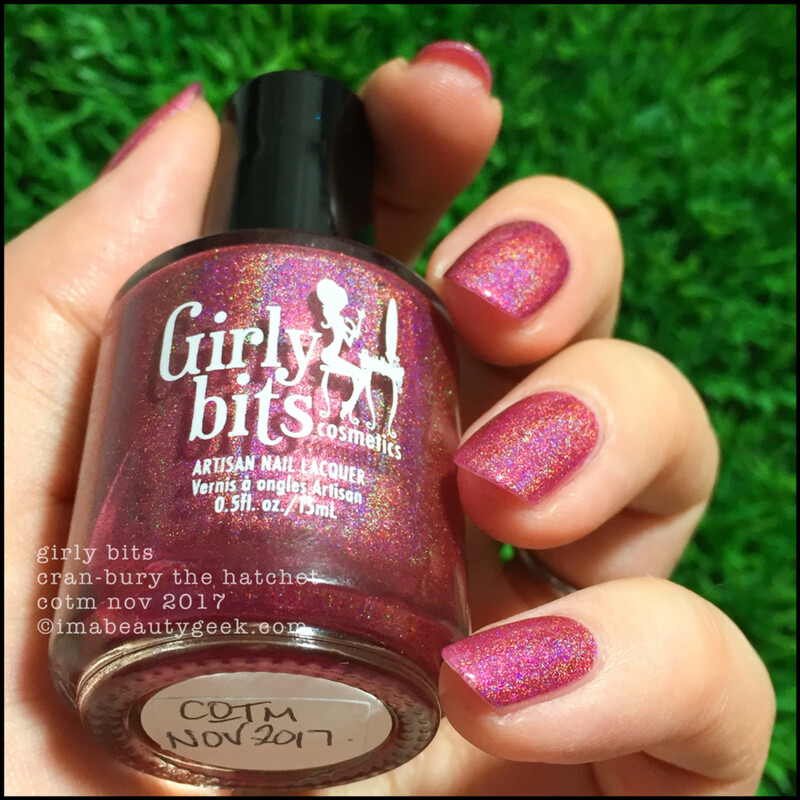 Girly Bits Cran-bury the Hatchet – Color of the Month Nov 2017 (above). It’s important to have a side of this with your Turducken – after all, it’s a Duo, man! 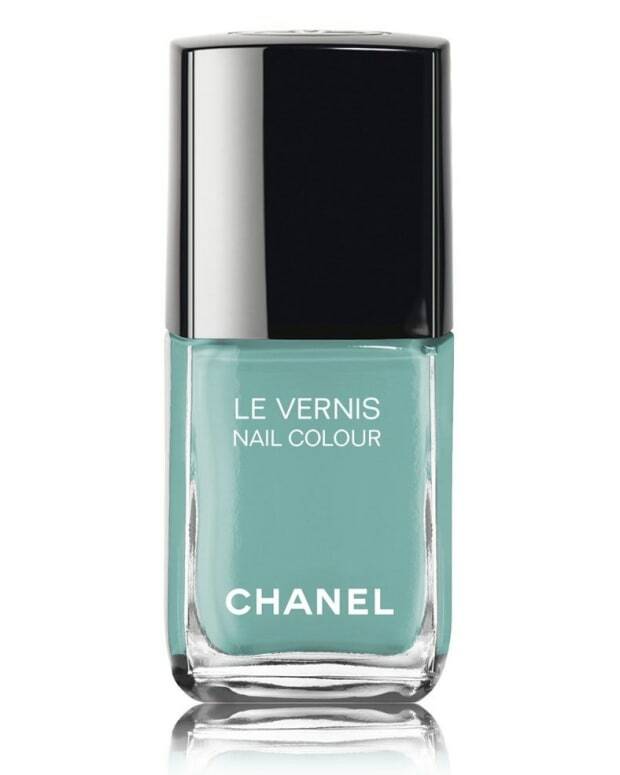 And I can’t even begin to tell you how much I love.love.love this shade indoors in natural light. It’s a crazy silvery, bluey berry that just makes me think of raspberry sorbet. Whack Cran-bury the Hatchet with some light and I don’t know if it’s just me, but it somehow turns all juicy and tart. When I look right at it, I’m not going to lie, I want to lick it. No, I’m not kidding. There’s a tartness that leaps out and punches me right in the mouf. I started to think about Sour Patch Kids. Yes, mouthwateringly tart. We all know I’m a huge fan of the slivery sheen that holos get when they’re out of bright light but this time, with this Cran-bury the Hatchet, I can’t decide if I like it better indoors or out. It’s one of those rare times that I&apos;m seriously conflicted. 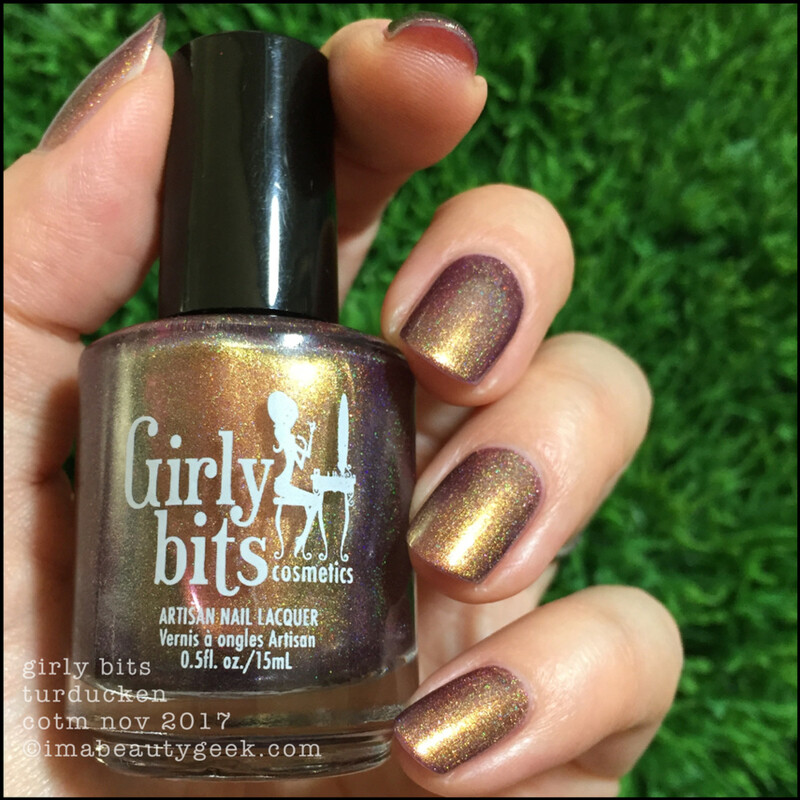 Both of the Girly Bits Cosmetics Color of the Month Duo shades knocked my socks off (and that’s not so easy to do). From the formulas (2 coats + top on both) to the huge transformations inside and out, this is exactly what I look for in an indie polish. Most people focus on the holo and the blingy but I think it’s fantastically special when a polish is beautifully stunning in any kind of light. When a polish hollers “Surprise!”, it gives me #GrabbyHands – big time. So? Which one? Or both! 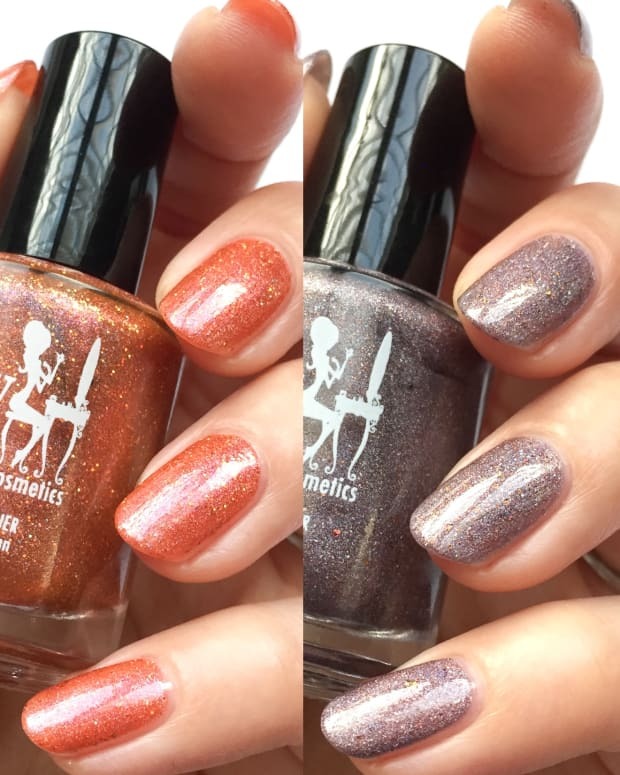 The Girly Bits Nov COTM duo is available as a pair ($31 CAD) until November 10th or individually ($16.50 CAD) from now until the end of November. If I was in the US, on Thanksgiving, I’d have Turducken all over my fingernails and a side of Cran-bury the Hatchet on mah toes. Yes, yes I would. 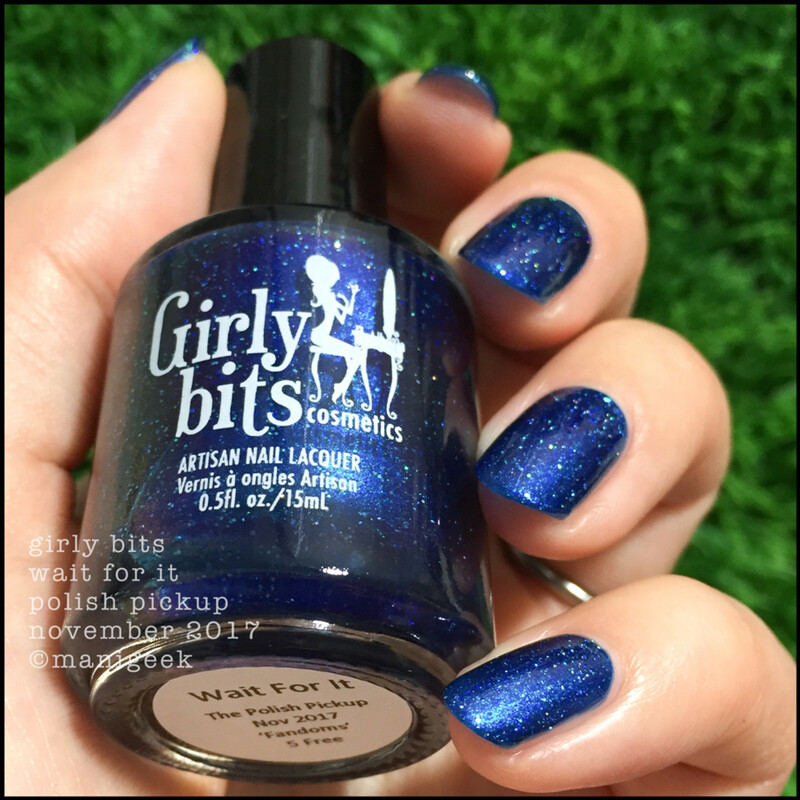 Girly Bits Wait For It – Polish Pickup November 2017 (above). Oh! Oh! Wait!!! 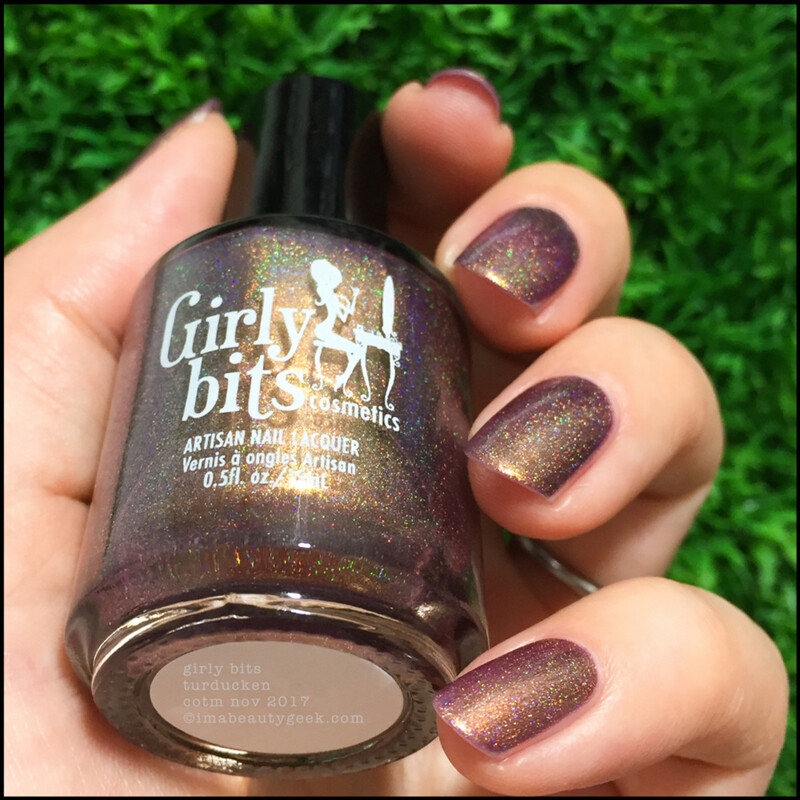 Girly Bits Pam made a Polish Pickup shade for November! Wait! I gotta show it to you before you go because the Pickup opens for 4 days in just 2 days! What’s Polish Pickup? It’s a magical interwebz place where a whack of indie makers get together and make polishes around a theme. Then they offer them all up for sale (from the 1st Friday – Monday of each month) and no matter how many you buy, shipping is a $3 flat rate! Yes! Even in Canada! Okay, so it’s all in USD and it takes a while to ship, but whatevz, $3 USD is like $5 CAD. In Canada, you can’t get nuthin’ shipped for $5 so if you’re an indie fan or just want to dip your toes in the indie pool, this is a most excellent place to start. Later, ya’ll! And Happy November! Manicures & photos Karen Falcon (she’s heading to the coffee pot now).